Click the Add button, select the files to add in the new window and then click the Open button to add. 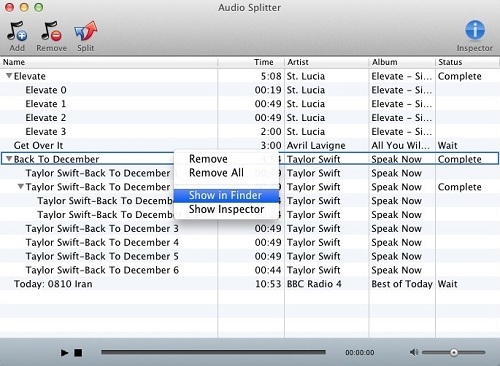 You can also drag the audio files to the list directly from your disc or other location. Or through the menu item File->Add Files to list to add the audio files to the main list. 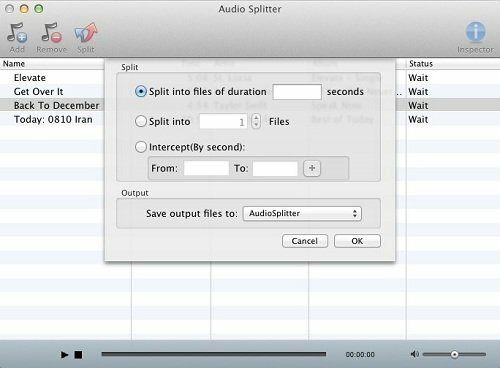 Tips: the audio splitter only supports splitting unprotected MP3 or AAC file format. 1: During ADD files process, coordinate hot key: Command or Shift key to select more audio files. 2: Drag and drop your selected files into the file list directly. Step 2: Click Split button to customize the splitting settings. 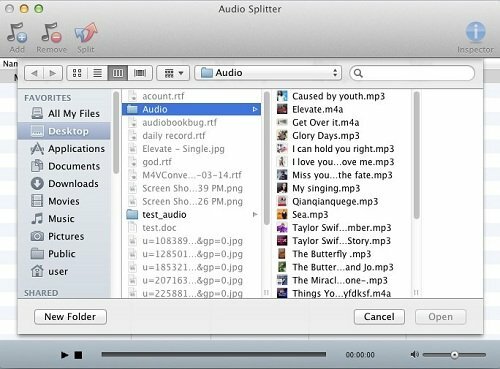 Audio Splitter provides users 3 methods to split the audio files. Method 1: The default option is splitting by the duration with the input seconds value. Method 2: Split by the numbers of segments, the default value is 1. Method 3: Split according to the starting and ending time by the input second value or click "+" button to increase the number of interception and click "-" button to delete the excess ones. Besides users can repeat the same period of interception or intercept fragments discontinuously. Click the Output drop-down list and select Custom to customize the output path. 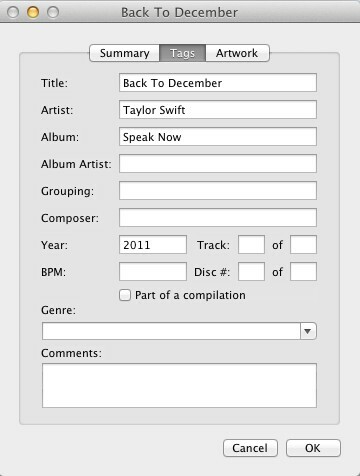 You can also use the default path ~/ Documents/ Audio Splitter. After the above steps, click OK button to start the unbelievably fast splitting. 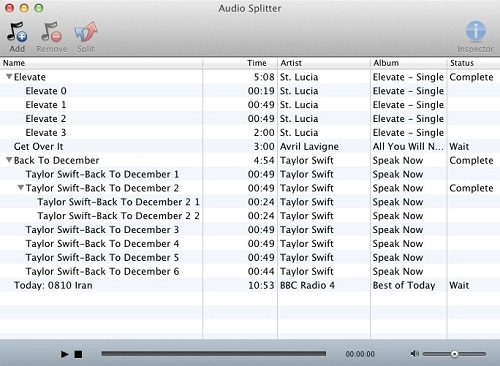 Audio Splitter can split the files to multiple smaller pieces in a few seconds. 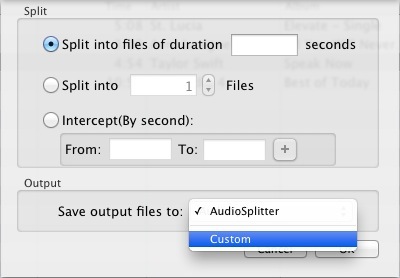 After the splitting, users can fast find the original or generated audio by right-click Show in Finder. Or you can through the menu File-> Show in Finder. You may inspect and edit the tags by choosing Show Inspector in context menu, or, click the button Inspector to inspect and edit the tags.